Back again and by popular demand, with a great concert for the Spring season. Playing their eclectic mix of Rockabilly and good old Rock’n’Roll. Tickets £5.00 available at the door. 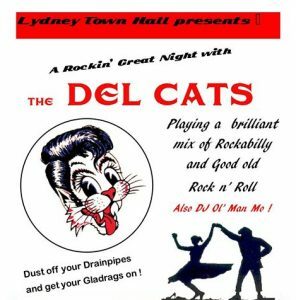 Following the collapse of the ceiling in the Town Hall changing room (due to snow – the Beast from the East), Del Cats and Mo are putting on this concert to help raise funds for the repairs. Come along and help support the repair of our historic Town Hall.